Hobbs Valve | The Great British Valve Group or The Great British Bake Off? Hobbs»Blog»The Great British Valve Group or The Great British Bake Off? This year’s Macmillan Cancer Support coffee morning was a little later than advertised as the Hobbs Valve, Cambrian Valves and Hobbs Precision Engineering teams concentrated on their busy year-end. Ensuring their respective clients received the products and services as promised. 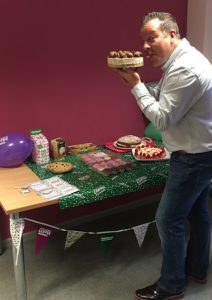 An annual feature of the Macmillan coffee morning has been the culinary contribution from our very own Gavin Wheeler. This year he has conjured up a chocolate cheesecake, and what’s more he enjoyed doing it. A study by The Henley Business School reports that 39% of those in employment have a “side hustle” that generates £72 billion for the UK economy. Could this be Gavin’s side hustle? Whether it be day to day business or a charity event, the people that make up our organisation will always give their best. Thanks to all for another great fundraiser.